Until now, it was hard for entrepreneurs to get hold of and keep track of Certificates of Insurance. It took time and money, which are two things you don’t have to spare when you’re building a business. That’s why we created the Next Insurance Live Certificate–an easy way for our customers to share proof of insurance easily and quickly, and totally online. It gives our customers one more edge over the competition, by eliminating any paperwork challenges and allowing them to prove their professionalism with the click of a button, anytime, anywhere. If you’re a Next Insurance customer, all you need to do is login to your account on our website and your Live Certificate delivers you the proof of insurance you need instantly, online, and maybe best of all, for free. You can easily tell our system to email your Live Certificate to anyone you need, or share a link in an email, a text message or a social media post you send yourself. 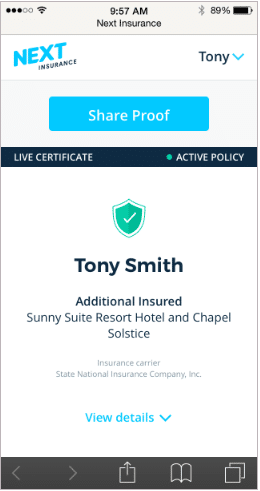 You can access your Live Certificate and add Additional Insureds whenever you want. There’s no waiting for anyone, no printing anything off, and definitely no fax machines. Insurance protects your business, and a Live Certificate shows your clients you’re serious, which is good for business. From personal trainers to general contractors and even Fortune 500 companies, every type of business needs the legal and financial protection of insurance coverage suited to its particular structure, personnel, equipment, and product or service. For many entrepreneurs, the ability to present a Certificate of Insurance as proof that they carry insurance is critical. The certificate can be almost as important as the coverage itself. In fact, at times it can make the very real difference between being hired or not. A Certificate of Insurance is a document, either electronic or physical, which shows anyone you work with that you have a valid insurance policy. Most Certificates of Insurance are from a company called Acord, and are sometimes referred to as “Acord certificates.” If you’ve had an insurance policy for some time, you are probably familiar with the PDF version, and may even carry a physical copy around with you. Many companies or individuals will ask you for it, in order to be certain that if something goes wrong, they won’t be stuck with a large bill. Having a Certificate of Insurance shows potential employers or clients that you are insured. That means that in the event of an unforeseen scenario like an injury or property damage, there is minimal risk of out-of-pocket payouts or unpleasant and expensive litigation, for you, or your customer. The ability to show proof of insurance is so important that it is often requested as a first-step prerequisite before anything else in the employment process. Many employers require showing proof of insurance in the form of an officially generated Certificate of Insurance before letting personal trainers train clients, painters paint houses, or handymen so much as pick up a hammer. Consider this scenario: a professional custodian working at a local high school accidently breaks through an important pipe while trying to fix a toilet. A huge mess is the result, with plenty of accompanying cleanup and repair costs. It’s the janitor’s fault, and he can be expected to be held monetarily responsible for the incident. Luckily for both him and the school, one of the first things he was asked when applying for the job was to show a Certificate of Insurance. If he hadn’t been insured, it would either fall on him to cover the damages entirely out of pocket – which would likely leave him financially flattened, if not ruined – or the school would just have to and pay for it themselves. Making certain that the janitor was insured at the start of their relationship was in the best interests of both the school and the janitor, and both parties walked away from the incident with their bank accounts intact. Insurance kept an accident from turning into a catastrophe, and the Certificate served as a promise that insurance was in place. Imagine that you’re a yoga teacher. For months, you’ve been trying to get in to teach at an exclusive yoga studio where you live, but there’s never been an opening. One Friday afternoon, you get a call: there’s an opening for a class that day, and they’d like you to fill in for the teacher who’s sick. There’s just one catch: you have to bring a Certificate of Insurance with you to the studio. In a case like this, the Certificate is the difference between being able to achieve your dreams, or watching them pass you by. Having instant, online access to your Certificate of Insurance gives you the confidence to go forward and teach that class, with you and the studio knowing you’re covered. Some businesses also involve risks to personal safety and expensive equipment. For this reason, it’s especially important for business owners such as photographers, construction, or fitness professionals to obtain liability insurance as protection in the event of an unforeseen scenario such as injury, customer dissatisfaction, or equipment breakage or theft. In all cases, having proof of insurance available to show in a flash will go a long way in showing your suitability and professionalism for the job. Prospective clients or employers also often ask entrepreneurs or business owners to provide a Certificate of Insurance with the employer listed as “additional insured”. That means that the employer’s name and address are listed on the certificate itself. In case something goes wrong, the Additional Insured listed on a Certificate of Insurance can also make a claim against the policy holder’s insurance directly. For example, let’s say the client of a personal trainer sustains an injury during training on the premises of a particular chain fitness center. The client may opt to sue both the trainer and the gym. When the gym has been added by the trainer as additional insured, the gym will be protected from a lawsuit by the trainer’s insurance policy. If the trainer runs off, the gym can make a claim directly against the trainer’s insurance, as an Additional Insured. For this reason, companies with work with small businesses or freelancers often require being added as Additional Insured. The importance of readily available proof of insurance is not specific to one industry. It extends to multiple businesses and industries – photographers, carpenters, fitness trainers, house cleaners, yoga instructors, and more. In any scenario where the potential for liability is involved, be it damages, dissatisfaction with product, injuries, allegations of impropriety, or many others, both the client and the small business benefit from establishing that there is coverage. Any insurance policy you take out as an entrepreneur should offer instant, easily accessible proof of insurance. The last thing you want is to have to wait for an office to open, wait on hold to speak to an agent, ask for a paper form and then wait two weeks for your request to be processed and for the form to arrive–sometimes at a cost per form. Unfortunately, the insurance industry has been slow to catch up to this vital need. Most companies leave their customers with no choice but to order their certificates of insurance by phone during standard customer service hours, and often wait weeks for their certificates to arrive – an outrageous demand if you’re a contractor or freelance worker who would need to have proof of insurance immediately accessible during business hours. There’s also the issue of cost. Legacy insurance companies usually charge anywhere from $7 to $15 per certificate, which can add up quickly and painfully if your line of work involves sending out large numbers of contract bids. There can also be charges levied for each Additional Insured, such as each subcontractor added by a contractor to his or her policy, or each gym where a personal trainer meets with clients. This all translates into a frustrating bottom line of fees paid, time wasted, and hoops jumped through – and depending on the nature of your work, this headache might also be a continuing and permanent one which could seriously get in between you and your income flow. Do you have questions about the new Live Certificate? Check out our FAQ here, and our blog post here.